Thanks to a new $496,113 Massachusetts Skills Capital Grant from the Massachusetts Workforce Skills Cabinet (WSC), Greenfield Community College will be able to upgrade and modernize equipment used in its Manufacturing and Engineering Science and Engineering Technology credit and non-credit programs and for-credit Computer Science and Networking program. The equipment will be used to train students and adult learners for careers in advanced manufacturing, engineering (including mechanical and audio engineering), and computer science/networking. Advanced Manufacturing is a focus area for Franklin and Hampshire counties and is an important sector identified in the region’s Workforce Innovation and Opportunity Act plans. Middle Skills and technological trainings are critical for high-demand jobs in emerging and growth industries in our region. As a result of these capital upgrades and the enhanced opportunities for students in GCC’s Engineering Technology programs, employers will be able to expand their internship and employment opportunities. The funds will be used to purchase a new Coordinate Measuring Machine, Advanced Manufacturing Computer Lab, Acoustic Engineering Lab, electrical controls, materials testing, CNC simulation and 3D printing equipment, interactive progressive programmable robotics, and computer hardware for server and operating systems. GCC will also be able to upgrade to interactive projector technology in over 30 classrooms and set up an 18-seat computer classroom in the Downtown Center. GCC collaborates closely with FHREB, FHCCs, Franklin County Technical School, and a consortium of manufacturing partners to inform program design on an ongoing basis, convening Upper Pioneer Valley Precision Manufacturers meetings monthly and participating in Western MA and statewide Manufacturing collaboratives, Community of Practice and Academic Program teams regularly. The Massachusetts Workforce Skills Cabinet (WSC) was created by an Executive Order of Governor Charlie Baker on February 26, 2015. The Cabinet aligns the Executive Offices of Education, Labor and Workforce Development, and Housing and Economic Development toward a comprehensive economic growth agenda. The Cabinet is charged with creating and implementing a strategy to ensure that individuals can develop and continuously improve their skills and knowledge to meet the varying hiring needs of employers in the Commonwealth. As part of the Workforce Skills Cabinet’s work to align resources to better meet common goals, the former Manufacturing Training Equipment grants (administered by EOHED) and the Vocational Opportunity Challenge grants (formerly administered by A&F) have been combined into one unified and integrated program – the Skills Capital Grant Program. The 2016 MA Economic Development Bill established three years of funding for the WSC to administer the Skill Capital Grant Program to increase the capacity and quality of vocational training and education by providing funds to eligible schools and institutions for the purchase and installation of vocational-technical equipment. GCC partners closely with Franklin County Technical School for evening, adult-education programs including foundational and precision manufacturing trainings for entry-level workers and welding. 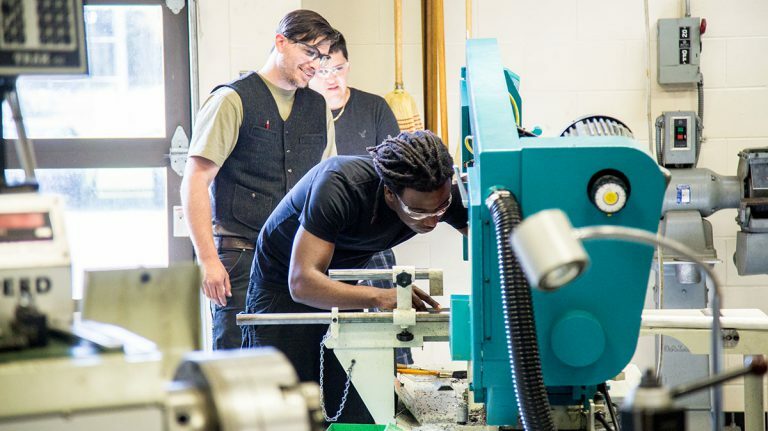 The development of a credit-bearing Engineering Technology certificate provides a pathway to students coming through the non-credit and vocational programs to continue to build and upgrade their skills. Increasing the computing, simulation and precision measuring of GCC’s labs and classrooms will allow additional students and incumbent workers to be served.